Thursday May 7th 1891 Will is 43 years old today. He celebrated the day by working hard. he took a load of hogs to market today and in the afternoon began to plant corn. I was busy about the work most of the day and getting ready to make soap. Friday May 8th 1891 I worked the greater part of the day with my soap. And one of the men was tearing down the old chicken yard fence and he helped me. We had churning to do in the afternoon and I made yeast and put out the tomato plants in cans. Will finished planting the fifteen acre field here in corn. I was very tired and went to bed early. Saturday May 9th 1891 Four of the boys got up and had early breakfast to go to Mt Vernon to a ball game. I was busy about the work most of the forenoon. I did not feel well all afternoon and went to bed early in the evening. This is Hatties birthday. she is 34 years old. 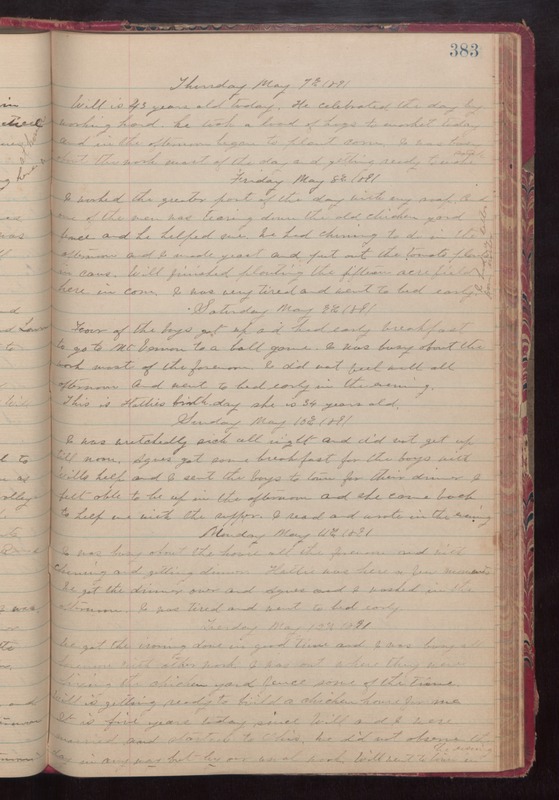 Sunday May 10th 1891 I was wretchedly sick all night and did not get up till noon. Agnes got some breakfast for the boys with Wills help and I sent the boys to town for their dinner. I felt able to be up in the afternoon and she came back to help me with the supper. I read and wrote in the evening. Monday May 11th 1891 I was busy about the house all the forenoon and with churning and getting dinner. Hattie was here a few moments. We got the dinner over and Agnes and I washed in the afternoon. I was tired and went to bed early. Tuesday May 12th 1891 We got the ironing done in good time and I was busy all forenoon with other work. I was out where they were fixing the chicken yard fence some of the time. Will is getting ready to build a chicken house for me. It is five years today since Will and I were married and started to Ohio. We did not observe the day in any way but our usual work. Will went to town in the evening.